Even when he's thousands of miles from home, President Trump defaults back to his "fake news" insult whenever it's convenient or politically expedient. On Friday, he deployed the term against a surprise target -- a British newspaper owned by his ally Rupert Murdoch -- along with two US-based networks, CNN and NBC. The White House Correspondents Association chastised the president in a statement later in the day. "Saying a news organization isn't real doesn't change the facts and won't stop us from doing our jobs," the association said. At a press conference on Friday, Trump dismissed The Sun newspaper as an example of "fake news," hours after giving an exclusive interview to the same paper for its Friday cover story. 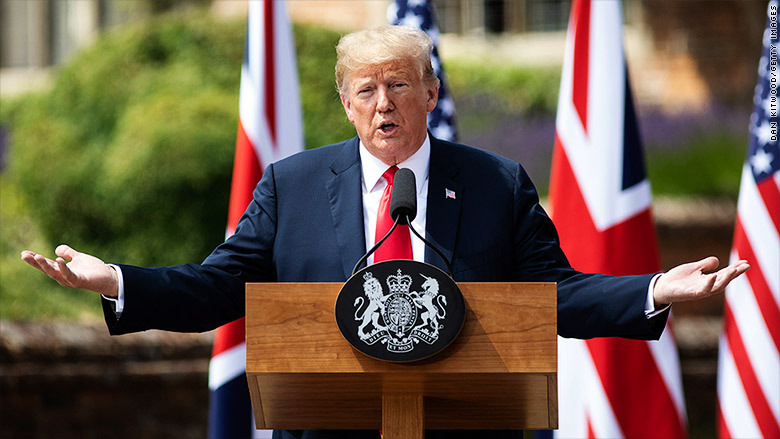 In the 28-minute-long interview, Trump made comments critical of British prime minister Theresa May's Brexit plan. The shocking remarks dominated news coverage in the UK and the US as Trump began a day of meetings with May on Friday. So reporters asked Trump about the jabs at a joint news conference with May. He accused The Sun of leaving out his positive comments about May. "It's called fake news," he said. "I didn't criticize the prime minister. I have a lot of respect for the prime minister," he added. "It didn't put in what I said about the prime minister and I said tremendous things." The Sun had already published audio recordings of key parts of the interview. Trump said his aides had their own recording of the interview and suggested the tape would prove him right. "Get it from Sarah," he said, referring to press secretary Sarah Sanders. So far, however, Sanders has not provided any tape. The Sun pointed out that its story did, in fact, include Trump's positive remarks about May. "We stand by our reporting and the quotes we used -- including those where the President was positive about the Prime Minister, in both the paper and in our audio -- and we're delighted that the President essentially retracted his original charge against the paper later in the press conference," the newspaper said in a statement. "To say the President called us 'fake news' with any serious intent is, well... fake news," The Sun added. Trump also derided two other news outlets, NBC and CNN, during the joint press conference. He called on NBC's Kristen Welker, who asked, "Are you giving Russian president Vladimir Putin the upper hand heading into your talks, given that you are challenging these alliances that he seeks to break up and destroy?" Trump: "See, that's such dishonest reporting," he said, lambasting both NBC and CNN, which he frequently lumps together. Later, CNN's Jim Acosta tried to ask a question: "Mr. President, since you attacked CNN, can I ask you a question?" "No, no," Trump responded, calling the network "fake news." "I don't take questions from CNN," Trump said, even though he did take a question from CNN's Jeremy Diamond on Thursday. Trump then called on Fox News correspondent John Roberts and called Fox "real news." On social media, some journalists criticized Roberts -- a former CNN employee -- for not standing up for the network. CNN's Jake Tapper tweeted that he is "old enough to remember when other networks came to the defense of Fox News WH correspondents during the Obama years. Such did not happen here. Lesson for the kids out there: no one should ever try to do the right thing with the expectation it will ever be reciprocated." Roberts issued a statement through Fox News defending Welker saying, "She is honest as the day is long." "For the President to call her dishonest is unfair," Roberts said. "I also use to work at CNN. There are some fine journalists who work there and risk their lives to report on stories around the world." "Asking smart, tough questions, whether in a presidential press conference or interview, is central to the role a free press plays in a healthy republic," she said. "Given that the president took a question from a CNN reporter in his NATO news conference just a day earlier, maybe he was letting off steam today rather than expressing an official stance toward a news organization's ability to report, but saying a news organization isn't real doesn't change the facts and won't stop us from doing our jobs. We appreciate The Sun for posting the entire audio of their interview so that everyone can hear the president's remarks for themselves."